Buy a 10 pack of OM MANI Buddha toros and get a free humidor of your choice! Golf Bag Cigar Humidor: Leather and holds about 9 50-gauge Churchills like a real golf bag. 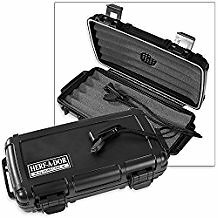 Herf-a-Dor 5 Cigar Capacity: Safely transports and humidifies up to 5 cigars with a maximum size of 8" long with up to a 54 ring. OM MANI Riders, comes outfitted in a flavorful Corojo wrapper, which hugs a core of balanced Honduran and Mexican long-fillers. Medium-bodied and producing abundant notes of cocoa, earth, and spices.